Having posted photos and stories of the Corn Palace in Mitchell, South Dakota, I thought I should also mention that Mitchell is not by any means alone in honoring corn in a big way. Sure, it’s probably the most impressive and certainly the most complex of the monuments to corn here in the Midwest, but it’s not alone. In Midwest Maize, I relate why Olivia, Minnesota, might actually feel justified in considering itself “The Corn Capital,” as the sign near the entrance to town announces, but simply being located in one of the country’s top four corn-growing states is a good starting point. 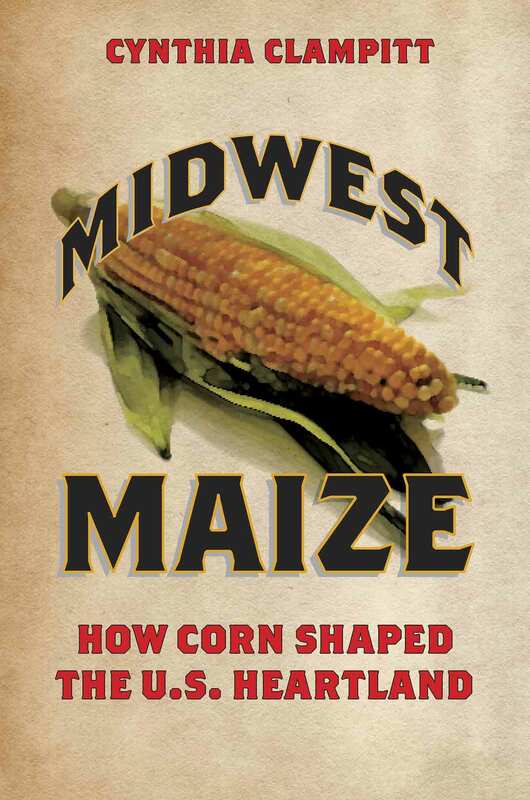 This spring, I was invited to give my presentation—“How Corn Changed Itself and Then Changed Everything Else”—at the library in Olivia, which pleased me, given the area’s corn-centric economy. 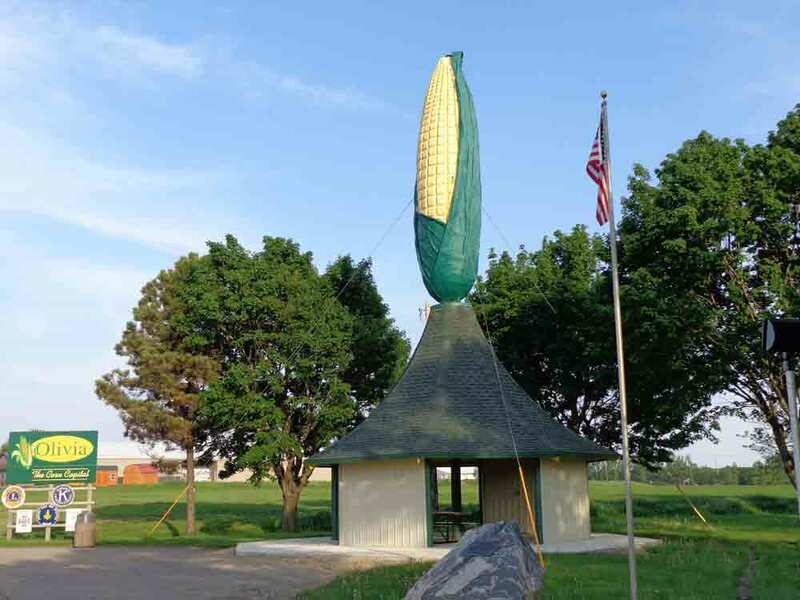 Someone in Olivia had supplied me with a photo of Olivia’s giant ear of corn, but when I visited, I was able to get my own shot of the big ear. Several months earlier, I had visited another impressive monument to the golden grain in Dublin, Ohio, not far from Columbus. 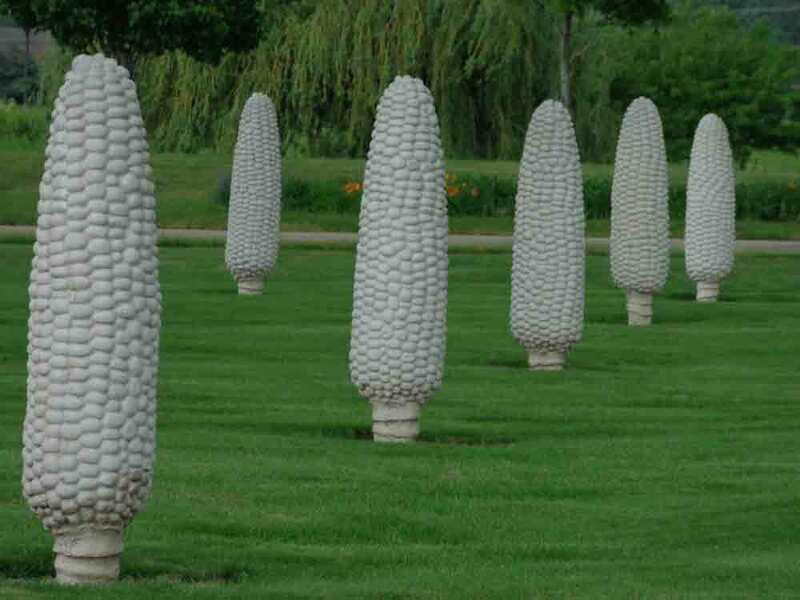 Here, an art installation titled “Field of Corn” features 109 concrete ears of corn that stand 6 feet, 3 inches tall. Worth noting is that it was not far from this area of Ohio that the Corn Belt actually started. Clearly, the massive impact of corn on the Midwest is very much appreciated by those who live in the region. In this video, Greg Peterson talks about (among other things) the abundant rain they got the summer this video was made (2013). Rain is one of those uncontrollable elements that make farming difficult. In 2012, I witnessed the problems that occur when there is not enough rain. Drought that year had a huge impact on crops. However, this year (2015), as I visited corn country in Ohio, Indiana and Central Illinois, I discoverd that too much water can be even more devastating. I saw fields interrupted by great stretches of water surrounded by stunted, yellow corn stalks, and I learned from a number of farmers that crops were more harmed by excess rain this year than by the drought of three years ago. Farmers who depend on corn to feed livestock were talking about alternative sources of food for the winter, since the corn was so hard hit in some areas. Thank goodness there are alternatives to consider, but this is another reminder of how difficult farming can be. One more thing to keep in mind when food prices fluctuate—nature is more often than not behind the shortages or abundance that we witness at the grocery store. Driving north from Pierre, I continued on my journey toward North Dakota. I crossed a lot of rich farmland interspersed with rolling, grassy wilderness. Small towns were few and far between, but generally delighted me, with their blend of new and old. A lot, I just appreciated as I drove past, but I couldn’t resist photographing these two buildings in far northern South Dakota. The first is a wonderful, old grain elevator. 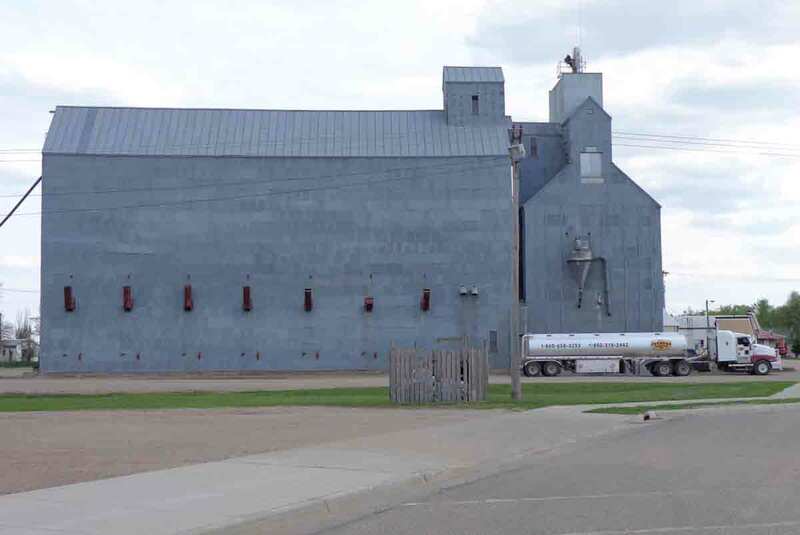 The style is similar to that of the Hawes Grain Elevator Museum in Illinois, about which I posted earlier, but the size is considerably greater. You can see the “downspouts” on the side that permit unloading grain into transport trucks. 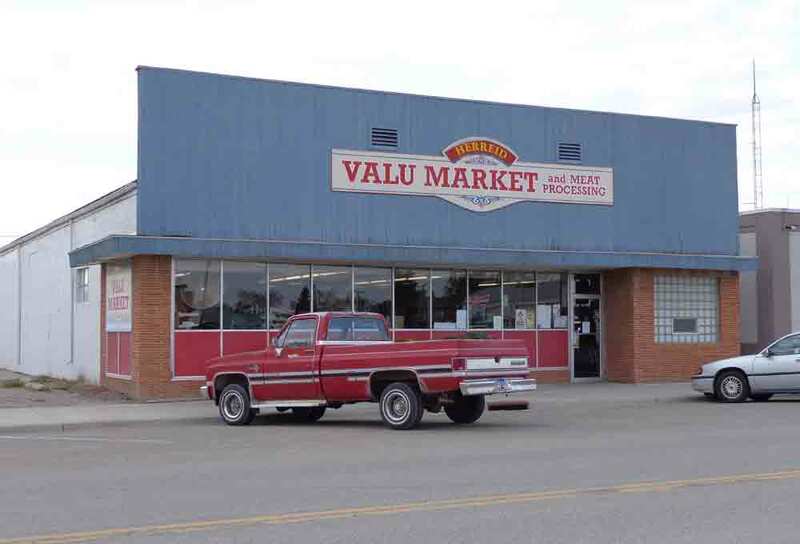 Across the street was a shop that reminded me that in rural areas, the separation between farm and food supply is not as great as it is in urban areas. Here, you can shop and get your meat processed. 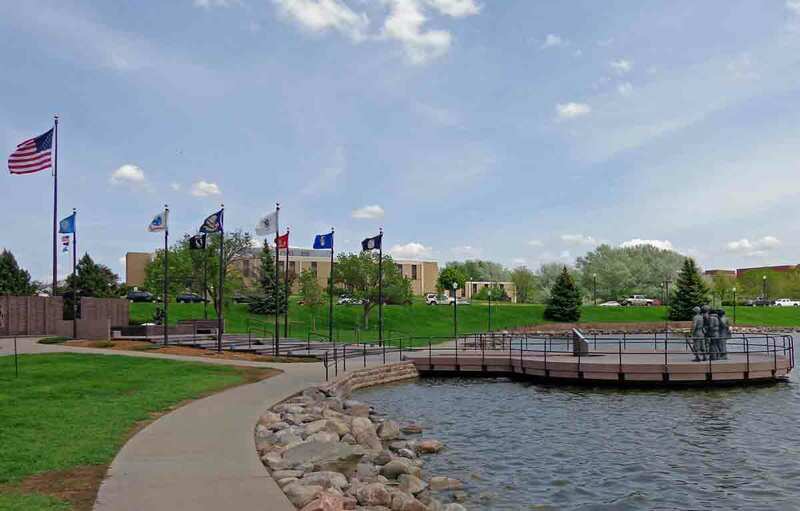 The city of Pierre, capital of South Dakota, is perched on a series of bluffs that overlook the Missouri River. The State Capitol, where members of the state government, including the governor, have their offices, sits atop one of the higher bluffs overlooking the city. The Capitol is a handsome, brass dome-capped structure built of native field stone, Indiana limestone, and Vermont and Italian marble. Begun in 1905 and completed in 1910, the building underwent restoration between 1976 and 1989. The lawns around the building are planted with trees from multiple states, all with signs showing the species and origin. Capitol Lake, a man-made artesian lake that attracts thousands of migratory waterfowl in the autumn. When I visited, it simply reflected the blue sky and sunlight. 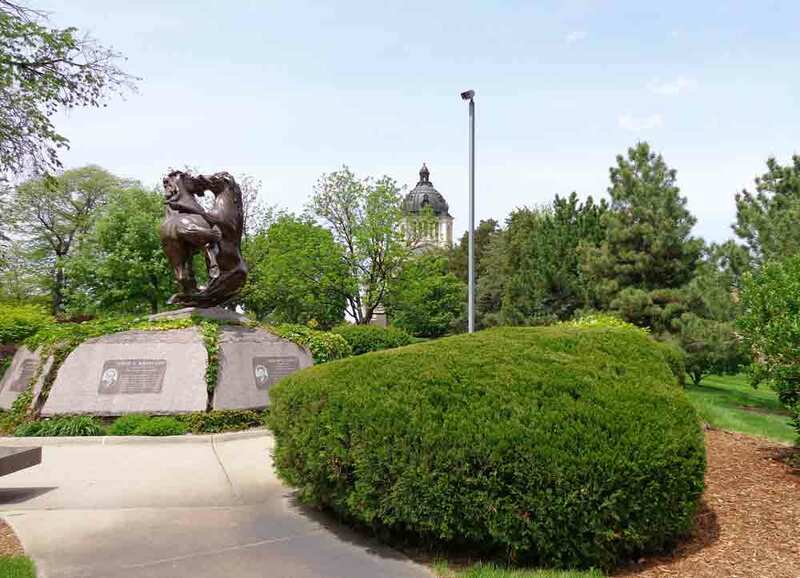 Walking toward the lake, I passed two of the memorial sculptures that can be found on the grounds: the Fighting Stallion statue, which commemorates a much-loved governor, state employees, and local business leaders who died in a plane crash in 1993, and the memorial to South Dakotans who fought in World War II. The World War II memorial features bronze statues representing every branch of the service, all saluting the American flag and the list of names of the war dead. It was a lovely spot in which to stop and wander for a while, but I had a schedule to keep, so soon, I was on the road again. From Mitchell, South Dakota, I was headed for North Dakota, but there were a couple of potential routes. Rod at the Discovery Museum in Mitchell had suggested following the Missouri River, and hence the “Middle Border” of the state. He said it would take me through an area without a lot of people, which I think he considered a warning, but I felt it was a bonus. Heading west out of town, I crossed an area of alternating but always interesting landscapes. There was still plenty of farmland, but more rolling than what I was leaving behind. This was interrupted by bursts of bare, rounded hills that rose up suddenly, usually near waterways, by surprising views from the tops of rises, and deeply carved arroyos. I thought to myself that it was very evocative of the type of region one saw in old Westerns, and then reminded myself that it was not evocative at all—it was the reality—this was the old West. I crossed the Missouri River at Oacoma (yes, towns also dotted my route). I began seeing more signs for historic venues, local wildlife, Native American Reservations, and Lewis and Clark sites. Then, turning northward on Route 83, I crossed into the Fort Pierre National Grasslands. The wide, rolling, treeless terrain was covered with short, green native grasses mingled with the taller, golden stems of last year’s growth. The Grasslands sprawl across nearly 200 square miles—and crossing it makes me think of those early settlers who must have been stunned by the seeming endlessness of it all. The sight of a few pheasants by the side of the road and a hawk circling overhead reminded me that I’d read that this was a popular spot with birders. As I drove, I was reminded that wind is one of the reasons the Great Plains remained treeless. Since it was early in the year and the grass was not really tall enough to show the effects of the wind, I wasn’t seeing the telltale ripple that indicated wind, but I could certainly feel it, with occasional gusts pushing my car about. Nearing settlements on the far side of the Grasslands, a few flags snapping in the wind gave visual confirmation of the smart breeze that had been buffeting me. The land became hillier again as the Missouri River’s meandering path brought it across the road again. 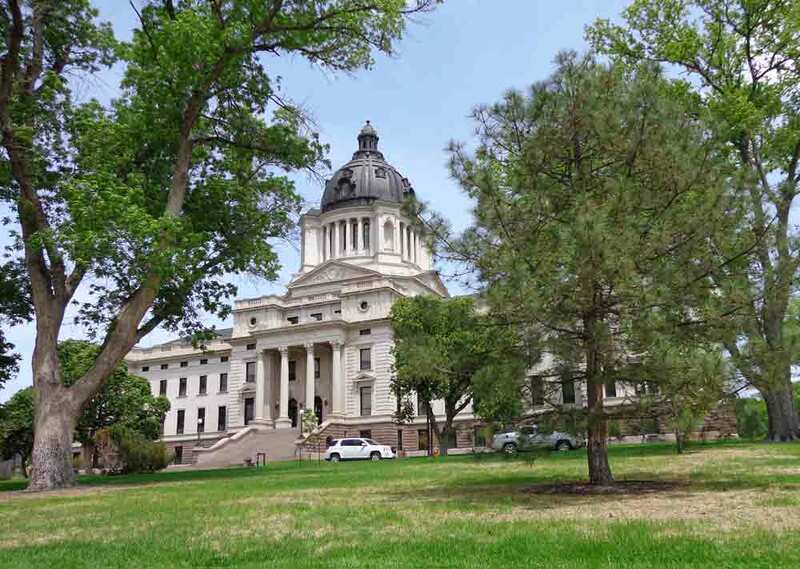 I crossed the river again and drove into Pierre—pronounced “Peer” in SD—the state’s capital. I’m not certain why — perhaps we’re nearing the end of the first print run — or maybe it’s because I’ve been getting more newspaper and radio interviews lately, so demand has gone up — who knows — but for some reason, Midwest Maize has been put on sale on Amazon, and the price is so low, if you manage to escape paying shipping, it’s less than what I pay with my author discount. So if you were thinking about buying the book, this is the time. I have no idea how long the sale will last — maybe just until the 17 books Amazon now says they have on hand are gone. But this would be a good time to get the book if you were thinking about it.